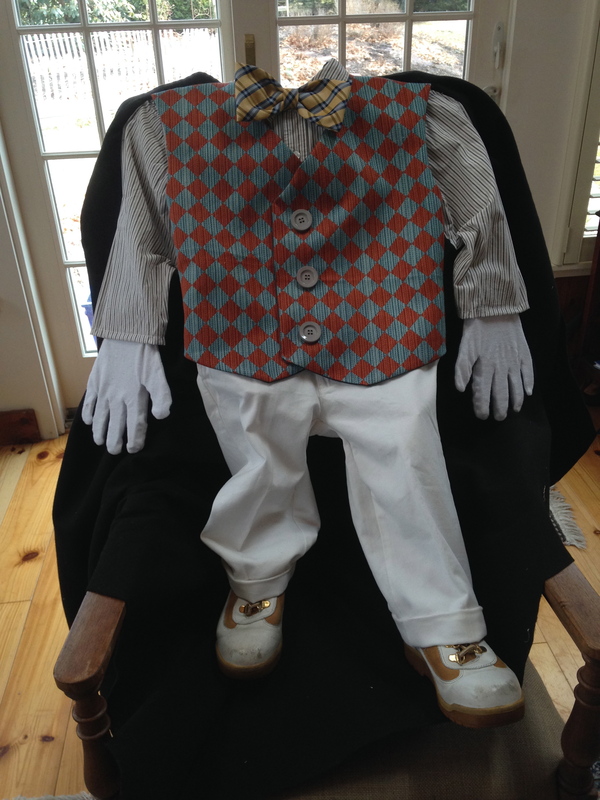 How I made the puppet costumes for Godspell, produced by Shining Light Productions. I wasn’t thinking of actually documenting the process at the time so the photos don’t show all the details but gives a pretty good idea of how it was done. After I was shown a video clip of what was wanted, I shopped for children sized clothing. I couldn’t find two small jackets or a small vest, so I made a vest from material I had on hand that I thought would represent the character. This is a women’s size six petit jacket that looked the right size. The madris fabric was perfect for the show. I added some plaid fabric over the lapels and pocket flaps for a little contrast and interest and changed the buttons. Here are bow ties that I quickly made with hot glue. 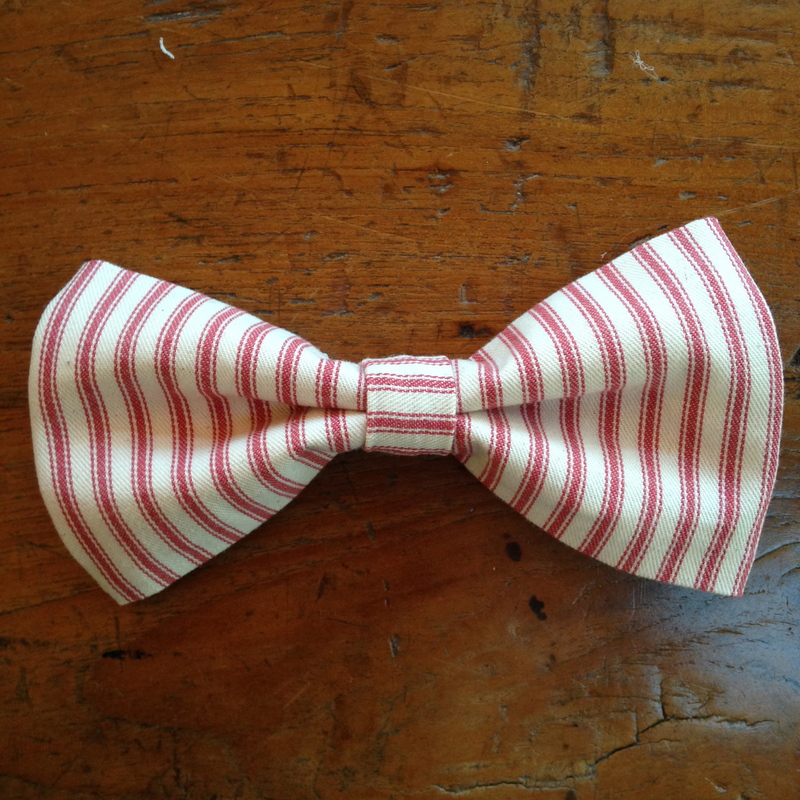 One was made from stiff French ticking fabric I had and the other was made from an old neck tie. I laid out the costumes and submitted this photo for approval before I proceeded to sew them to the black fabric. For the hands, I traced them on stiff cardboard and cut out hand shapes with a blade. I then glued the dowels between two pieces of cardboard. I hot glued the cardboard to the gloves just at the wrist part of the gloves then I hot glued the finished hands to the inside of the shirt sleeves around the seams. 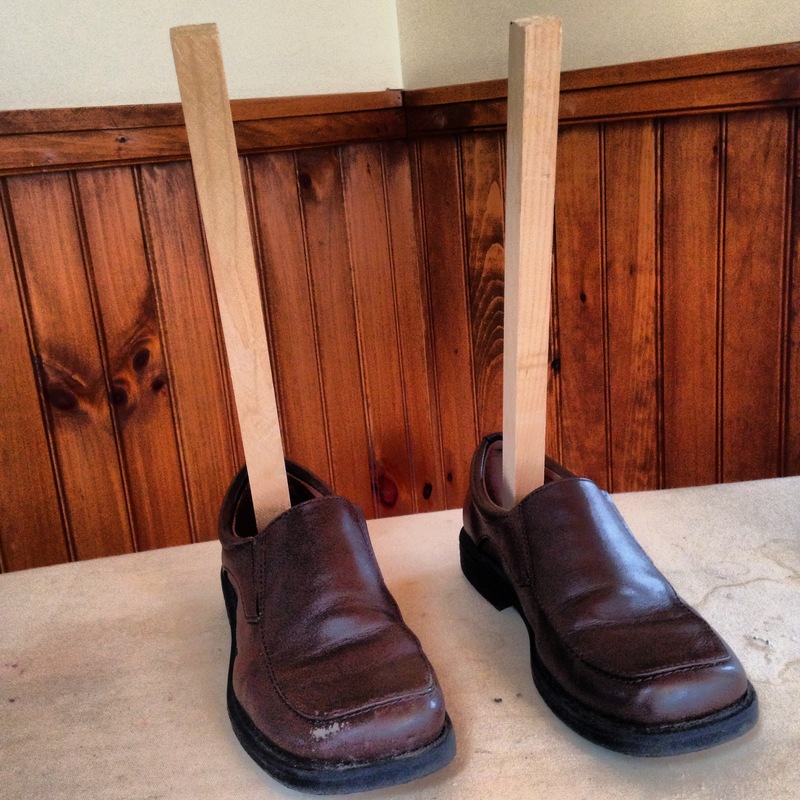 So the actors could also manipulate the legs, I drilled holes through the bottoms of the shoes and screwed in sticks that measured the height of where the knees would be on the pants of the puppets. That way, when the actors’ put their hands on top of the sticks it would look like the knee joint. I cuffed the pants so when I glued them to the shoes the glue wouldn’t show. I waited until I was all done sewing before gluing the shoes to the pants. I sewed the clothes to the fabric around the sides of the shirt, the sides of the vest, then from the collar to half way down the arms (both sides of the arms). Then I cut out the back and stitched the openings shut behind the pants and arms. After taking a look at the completed costume for the second puppet I made, I thought it needed a different colored bow so I quickly made another bow from red French ticking I had on hand. And here are the actors trying out the costumes for the first time at a dress rehearsal. 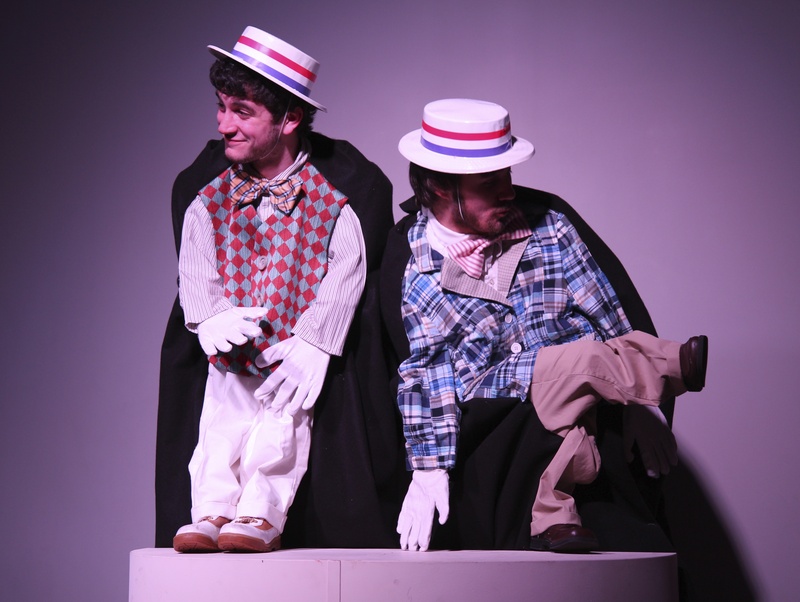 I took the hats home and glued on ribbon that matched each puppet. The final look can be seen in the first photo above.